Q. What is the network configuration? *(1): Bringing their own laptop. *(3): Bringing all their own equipment; not demoing in Sky room. Default net address: 147.73.X.1, where X = 32 -- 43. Q. Who do I contact if I have questions or problems? A. Please contact Dave O'Hallaron (droh@cs.cmu.edu) with general questions. Please contact Ken Goodwin (goodwin@psc.edu) with specific questions about the network setup. Q. When and where will the demos be held? A. The demos will be shown in conjunction with the reception and poster session on Wednesday evening, 6pm - 8:00pm, Aug 2, 2000, in the Sky Room, on the 17th floor of the William Westin Penn Hotel. Q. How will the demo session be organized? A. Each group will give one-on-one demos to the HPDC attendees during the reception. We'll have food and drink in the room to ensure a good flow. We'll also set up a laptop projector and screen on the wall opposite the door. Each group will have a 10 minute time slot where their demo is featured. During this time slot you can give a presentation on the laptop projector. Q. 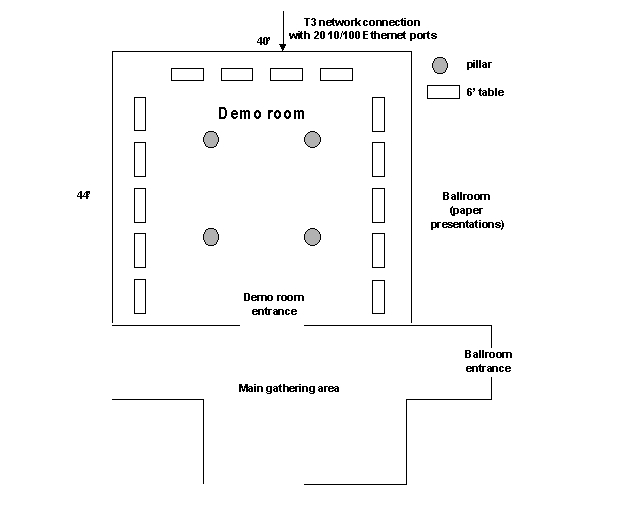 What is the setup of the demo room? A. Each demo will have its own 6' foot table and network connection and can remain set up for the entire conference (as an exhibit) if you would like to show your work one-on-one or during breaks. Q. When can we get into the demo room to set up our demo? A. The demo room will be available (with working network connections) to demo groups Monday afternoon (July 31) 3-5pm, all 10am-5pm Tuesday (Aug 1), and 10am-5pm Wednesday (Aug 2) for groups to set up their demos. We'll have a key to the room, so if you need to work in the evening, we can arrange that as well. Q. Who do we talk to if we run into trouble during the setup? A. Both Dave O'Hallaron (droh@cs.cmu.edu) and Ken Goodwin (goodwin@psc.edu), our networking expert from PSC, will be available at the hotel to help you get your demo set up Monday morning, and all day Tuesday and Wednesday. Q. When do you expect the network to come up? A. Ken will be setting up the network Sunday Aug 30. We expect it will be up and running the evening of the 30th. Q. What kind of network connection will we have into the demo room? A. The demo room will have 20 10/100 Ethernet ports attached to a 44 Mb/s T3 connection that terminates at the Pittsburgh GigaPoP. Q. What about a connection to a high-speed backbone? A. We have received permission to route our traffic over the Abilene backbone. The Pittsburgh GigaPoP provides a 155 Mb/s OC-3 connection to the Abilene backbone. Q. How are you expecting to do IP Multicast peering with Abilene? Will this be through M-BGP, MSDP, and PIM Sparse Mode? A. The router at the conference will MBGP/MSDP/PIM-SM with the gigapop multicast router, which in turn does the similar thing with Abilene. Q. Has Abilene agreed to transit your traffic to vBNS, ESNet, and their other IP Multicast peers? A. We did not ask this explicitly, but will hope to have an answer to this soon. If there is a problem, we may be able to pick up vBNS ourselves by setting up multicast with them. Q. What kind of switches will the demo network use? Is there any possibility you would be able to use Ethernet switches that support IGMP snooping instead of CGMP? A. Cisco is providing Catalyst 2924 10/100 switches. These will only do CGMP. Q. How do we get the equipment for our demos? A. If you want us to provide you with equipment, please coordinate with Dave O'Hallaron (droh@cs.cmu.edu). Or you can ship your own equipment to the hotel. Q. What is the shipping address of the hotel (in case we want to ship some our own equipment)? IEEE Computer Society HPDC 2000.
x of y (e.g., 2/4 if this is the second of four boxes you sent). Q. What are the equipment needs of each demo group? Large monitor (will provide their own laptop). fast SGI IRIX box with large monitor. Will supply all their own equipment. Linux box with large monitor. Any box with SSL enabled Netscape and large monitor. Windows box with IE5 and large monitor. Linux box with medium to large monitor. Linux or Solaris box with X-windows and large monitor. None, will bring their own equipment. Windows NT box with large monitor.